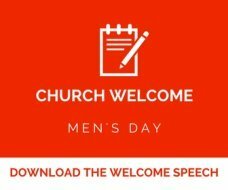 Looking for welcome speech for men's day program? I presume this is your first time have been asked to prepare for a speech during the men's day in your church. You might be worried what to say during the occasion. Brethren in Christ, I feel humbled to stand before you during this hour that the Lord has given us to be here today, I feel privileged to welcome you to our program for the men in our church. Let me thank our Lord for the wonderful gift of life and time that has bestowed upon us. As we share today for the many activities that we have lined up during this day.May the love of God be with us. Feel at Jesus feet and may we learn something out of this day that comes once in a year. I greet you all through the name of our Lord Jesus! I feel humbled to stand before you today as I welcome you to this very important occasion in our church calendar. Today is men's fellowship day and we are very happy to have special guests in our church today. If you look around,can see men in black and it is a sign that all men of this church are special guest and we are happy to announce that from today we are rededicating our lives again to the service of the Lord. We are asking the church to keep on praying for us and generally our many so that they don't pull back as the norm is. I know we all that it is the culture of men not to dedicate themselves to the work of the Lord like our women everywhere. Therefore we are thanking the Lord today for this wonderful opportunity given here. Feel welcome and Jesus loves us all. We are going to be of great assistance to make it happen as you desire. If you need a guide that can take you step by step until you deliver the speech, we have prepared 35 page ebook, which is assisting very many people who were stuck before and didn't know how to write and also deliver a speech in church. We have received and still receiving many testimonies concerning the help that they are getting. If you want a copy then, just follow this link and you will download your how to write and deliver church speech. It will show you how to write any speech for the church including welcome speech for men's day program. If you want us we help you to write one, then you can contact us now and give us the details then we can assist you to write one. Otherwise this is what you expect in your speech. We hope the above sample speech has been of great help. We want to take the earliest opportunity to wish you all the best as you prepare for the occasion in church. May the love of God be with you and the whole church. Let the Holy Spirit be with you and as the programs of the church has been planned let the will of God be done. Get the above ebook and you will be able to write one that is specific and fits the occasion. Otherwise, let us wish you all the best as you prepare for the occasion and God fill you with the Holy Spirit as you speak. What a joy to see another day that the Lord has given us to congregate here as we fellowship together and learn of Jesus . I want to thank each and every one of you for finding time to come to the house of God as we share and thank together our God who is heaven for what He has done to our lives to make us be alive to this day. We know that many people aspired and wished to see this day but wouldn't make it but me and you through the mercies of God We are happy to meet here despite our shortcomings. Let us all remember that we live by the grace of God and the mercies that God renews each morning for us to see another day. As we start this fellowship may the love of God be with us now and until we finish.